Yup. Tis them again. You have serious problems back home in the USA of course. Every country has its problems but ... be thankful you don’t face this PC - BS on a daily basis. I think Americans however would be far less likely to put up with this group to the same degree the Brits think they have to. The cancer eating Europe, the worthless sponges and professional no goods the Germans didn’t have the time left to finish off. Hmm. Kinda like .... Secretariat? Has a Bolshie ring to it. If you missed the original story concerning this case, the grandma simply opposed them and also complained about her vehicle being blocked by theirs. She may have used a term like, and I am imagining this cos I do not recall her exact quote, she may have said “you people” which would have been enuff to trigger a threat and charge of .... raaaaaaacism! Gipsies who falsely accused a grandmother of racial abuse are set to be given a new caravan site at a cost to the taxpayer of more than £500,000. The move has outraged people living near what is currently tranquil farmland, with at least two imminent house sales said to have fallen through as a result. The council behind the proposal has already spent £145,000 trying to throw the group off their existing camp on green belt land. And the gipsy family meant to benefit from the new site have said there is no guarantee they would move there in any case. The plan would see taxpayers provide a new site for five mobile homes belonging to the Linfoot family. Last year the family falsely claimed toy shop owner and community stalwart José Hampson, 78, had called them ‘dirty ******* gippos’ in a row over their illegal camp. Mrs Hampson, a widowed former Sunday school teacher, was given a criminal record after being found guilty of racially aggravated harassment, but after an 11-month nightmare her good name was restored when a judge quashed the conviction. Now the council has been told it must find the Linfoots a permanent site and residents of a quiet row of terraces this month learnt that farmland behind their homes had been chosen – despite being the most expensive of nine potential sites to develop, at £560,000. The proposal has led to a campaign from residents of Cowling Road, the chosen site on the edge of the Lancashire market town of Chorley. Currently grazed by cattle, the land was reputedly given to the council by a former mayor for £1 on condition it was used to benefit the townspeople. Glenn Hutchinson, landlord of the adjacent Spinners pub, said: ‘It’s not the right place, it’s as simple as that. Chorley council identified nine potential sites for the Linfoots’ five caravans and earlier this month announced that it had chosen a site known as Cowling Farm. The proposal is now out for consultation. 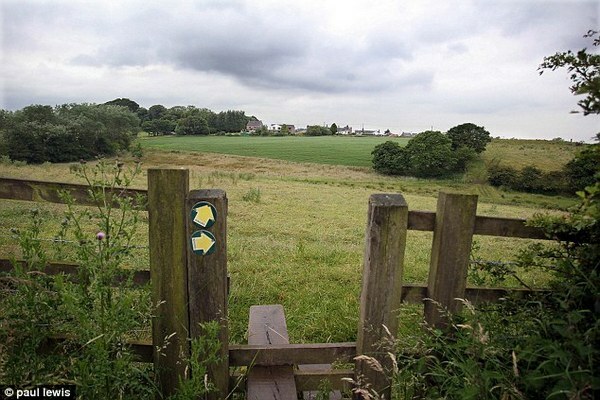 Chorley council had set aside £145,000 to evict the Linfoots from a plot of green belt land they own less than a mile away. But last year it was forced to give them temporary permission to stay after the Planning Inspectorate said the council had failed to make enough provision for travellers and gipsies. We have site here, just at the end of the street that looks something like this, but even better and more of it. If you think ppl don’t worry about that, think again.